In DriveWorks Solo you can create interactive and dynamic Forms easily by linking Form Controls together using Control Properties. 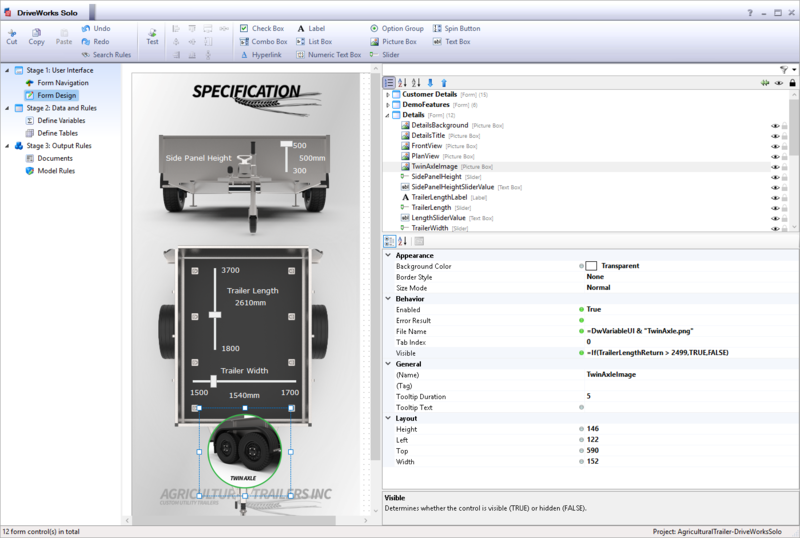 By linking Control returns to other properties it is possible to change positions, visibility, values and selections within the DriveWorks Form and Project. This allows you to show different options based on selections and rules to aid guided selling. In this example we are driving the form to display an image if the length is 2500mm or higher. This informs the user that if their trailer is larger than 2499mm they require a twin axis. In this example we are swapping the image for one with a green border to show that a spare wheel option has been selected. On the right, you can see that if the length of the trailer exceeds 2499m we will display an image to show the trailer requires a twin axle and we drive the width minimum value to be increased from 1200mm to 1500m. Linking Form Controls is a quick and easy way of improving user experience and providing guided selling. This trailer example uses the Visibility, File Name, and the Default Value Properties to change the controls to be reactive to other values that are driven on the Form. More advanced Projects may use multiple Forms with Decisions. Decisions allow the Project creator to build Rules that will alter the navigation of the Project Specification when run. For example, In this Trailer configurator, we could create a Checkbox Control that asks the user whether they want accessories or not. We could then add a decision to our Form Navigation tab. A rule would be added that states If the accessories Checkbox is ticked, the next form is accessories. Otherwise, don’t show the accessories Form at all. 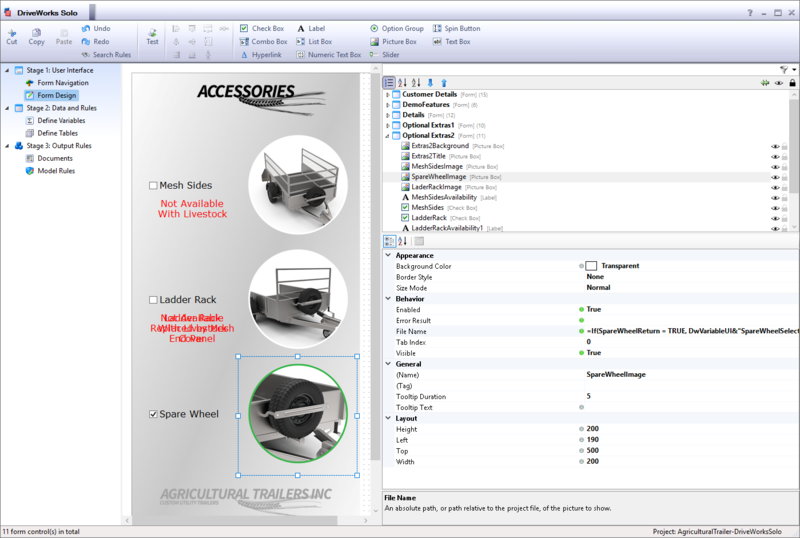 Download the DriveWorks Solo Agricultural Trailer Configurator Sample project to explore how the Control Properties are linked. There’s also further useful information in the DriveWorks Solo Online Help File.